One of the common phrases in China to describe a hot blooded, hard working and enduring young person is a pseudo-medical therapy that was popular in the Cultural Revolution and was mainly practised by village doctors and traditional chinese herbalists in the 1960s. It is banned by the government. However there has been research that has shown that it has the potential to be a source for therapeutic compounds for various diseases. The therapy consisted before of simply drawing blood from a rooster and injecting into the patients intramuscularly or in the vein. Apparently the benefits of this therapy includes reducing high blood pressure, stroke, infertility issues, psoriasis, coughs and colds. But recently, there has been evidence to prove that it helps with edema, heart disease, Presbyopia, diarrhea and hair loss. Take a male rooster about 4 kg, and inject about 10-100ml of chicken blood intramuscularly once a week. The therapy was created by a doctor named Yu Chang Shi俞昌时who when he was 19 studied medicine in Shanghai Medical School before entering the Communist Party when he was 25. And during 1927, he even became a government official in the district Nan Ling but later lost contact with the party. In June 1959, Yu Chang Shi discovered whilst working as a doctor for the employees at a textile mill factory that after injecting 1ml of chicken blood into 203 workers, it improved period pains and blood loss, headaches and indigestion and constipation by 65%. But he also noticed side effects such as swelling of the nymph nodes, fevers and hives in 35% of the patients, which may be due to an immune response to the foreign material present in the chicken blood. 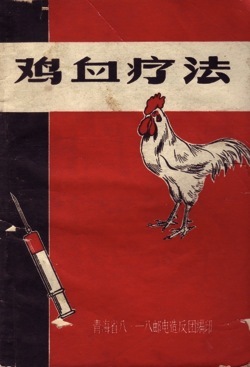 In 1964, he published his a book called Chicken blood therapy of his findings from 100+ cases and also wrote a letter to the Ministry of Health and to the Chinese Academy of Sciences about his findings, which at the time was supported by many famous and experienced doctors, especially traditional chinese doctors. But Yu Chang Shi was unhappy with the effects of intramuscular injection and began to inject chicken blood intravenously into his patients. In June 1965, however, a group of established scientists held a meeting and decided that foreign protein present in the chicken blood may induce an immune response in the body and was hence unsafe to use in practise. Although no deaths had occurred as yet, however if it was continued, there may be incidents. Furthermore, chicken blood was used to treat chronic conditions where the patient was already weaker and was suffering from other condition as well as the one being treated therefore they were more at risk if an accident was to occur. They sent a letter to the Department of Health who after passed out a notice preventing the use of chicken blood therapy and any persons who ask for this therapy, the medical team must dissuade the patient from their request. Thank you! This was very interesting. Interesting to see there is some scientific basis on it’s efficacy. Shame they couldn’t perform proper clinical trials on this but I suppose there would be all kinds of ethical issues especially now.